Are you booked for an outdoor gig that will be in extremely cold or hot weather? Have an allergy to silver or gold plating? Looking for a feel which is very unique, soft, silky, and has more grip than silver. Lexan may be an option for you! The Lexan option is only available on new mouthpiece orders. 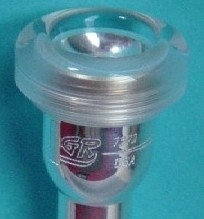 We take a brand new GR Mouthpiece and cut off the rim. The underpart is then threaded. Next, GR will cut and thread the Lexan rim so it matches the underpart perfectly. Lexan will have a very secure grip. It does not hold the heat or cold so it is perfect for outdoor gigs, parades, etc. You will find a lighter overall feel to the mouthpiece but out front, your audience will not know that you are playing a plastic rim!